Data`s limited understanding to understand human behavior, his childlike willingless to learn more, and his tendancy to take things at face value all make him extremly innocent. Before he recieves his emotion chip, he is unlikely to be corrupted by his experiences, and since he cannot be disappointed, he never becomes cynical or jaded. His actions are not governed by his ego, but by an ethical programme that gives him a sense of loyalty and duty. Data`s simple understanding of human motives can make him appear idealistic. For example, he believes that friends will always help one another because that is part of his definition of friendship. His own artless behavior often means that he has difficulty understanding the behavior of others, or assumes that they are acting from noble motives. In his innocence, Data has trouble comprehending metaphors. When Commander Riker tells him that the crew are looking for a needle in a haystack, the android doesn`t understand why anyone would waste their time in such a search. He assumes that everyone says exactly what he or she means, when Kieko Ishikawa tells him she cannot marry Miles O`Brien and that calling off the wedding will make her happy. Data takes her statement literally without realizing she has gotten cold feet. Data also believes his brother Lore when he says that the colonists on Omicron Theta were envious of him because he was so completely human. Lore also tells Data that the colonists petitioned Dr Soong to replace him with a less perfect android-Data. When Data discovers in 2367 that these are all lies, he is as astonished as an emoytionless android can be. One of the reasons Data remains innocent for so long is his inability to understand the consequences of some of his actions or words. As a result, he is often honest to a fault. In 2367, he embarks on a romantic relationship with fellow crew member Lt Jenna D`Sora. She begins to have doubts about her relationship and asks him what he thinks about when he kisses her, Data calmly replies that he is performing a number of tasks which include calculating the exact ammount of pressure to apply to her lips. Occasionally, Data`s lack of understanding can lead him to act in ways that might seem thoughtless. For example , when Worf falls off a holographic ship and Geordi tells him it was funny, he pushes Dr Crusher into the water too. Data was created with a moral point of view and his behavior is governed by an ethical programme that was designed by Dr Soong. This programme seems to place a particularly strong emphasis on loyalty, Data is dedicated to Starfleet and the people he works with. When he is functioning normally, his alliegence never seems to be in doubt. Data`s personal and professional loyalties are only rarely put in conflict. Lore does manage to turn Data against his crewmates, but only by deactivating his ethical programmes and feeding him negative emotions. Later in 2371, Data admits he is tempted by the Borg Queen`s offer of organic existence, but his moral code is too strong for him to give in to temptation. Data has virtually no ego, and he has great difficulty understanding how it affects the way others make decisions. Tyoically he assumes that people will behave the way they do for logical reasons. Data`s lack of selfishness has had a profound effect on his relationships with others. 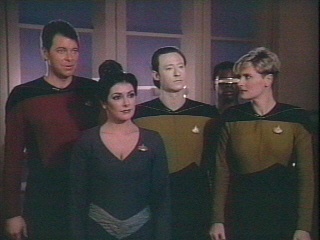 When Tasha Yar is under the influence of a variant of the Psi-2000 vitus, she is delighted to discover that Data is programmed in multiple sexual techniques. But even though his experiences with her have a lasting effect on Data, he has no need to brag about their relationship or to pursue it when the virus wears off. Data has a tendency to assume that others will observe the same ethical standards as he does. For example, when Tasha Yar`s sister, ISHARA, is brought aboard the U.S.S. Enterprise NCC-1701-D, Data believes her intentions are good and that she would not hurt anyonw who Tasha calls a friend. Unfortunately, Ishara betrays Data`s trust, but he is puzzled rather than angry. Another factor in Data`s continuing innocence is his limited ability to evolve. Whereas a negative experience might make another person bitter, Data is theoretically incapable of this kind of response. However, even though Data believes that he cannot experience emotions, negative or otherwise, evidence suggests that this is not strictly true. His ethical programme tells him not to harm others unless it is absolutely necessary, but it seems data is not quite so innocent as he seems. In 2366, he is taken prisoner by KIVAS FAJO, a ZIBALIAN trader who adds Data to his collection of rarities. During his captivity aboard Fajo`s ship, Data sees Fajo kill one of his servants and decides that Fajo has no redeeming qualities. When he is presented with the chance to kill Fajo, he attempts to shoot him, even though his life is not endangered. Even though Data has a remarkable ability to remain untainted by his experiences, and has high moral standards, it is clear he can evolve. Now that he has emotions and is becoming even more human, it seems inevitable that his innocence will fade away.